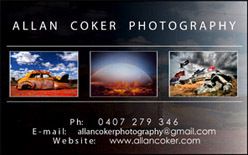 I am a passionate photographer based in Sydney Australia. Have a look at this site if you are interested in seeing some images of our landscape, our culture and our sport. Also follow me on Instagram @allanspics. Go to the links page to find images of the many events I have covered, particularly sailing, kayak racing and the Outback Car Trek. There are also a number of Google photo albums featuring recent personal work. E-mail me if you want copies of any of these images.